Facebook has plenty of interesting options for creating retargeting campaigns, but with so many different choices, it’s hard to tell whom to target first. What are the remarketing audiences with the highest ROI on Facebook? We conceived this month’s experiment hoping to find the perfect Facebook remarketing audience that will help you turn leads into customers. Keep reading to see what we discovered! While we can’t say for sure what will work for your brand, we wanted to give you some guidelines and advice on Facebook retargeting audiences. So let’s start with a quick recap before wearing our lab coat and diving into this new experiment. The list is even longer, presenting many awesome opportunities for turning warm leads into paying customers. In this month’s experiment, our campaign’s goal was to get people sign up for a free AdEspresso trial. We supposed that people who have engaged with our page posts, become a lead or visited our website all have a high potential of creating a free trial account to test AdEspresso. We also thought that people who downloaded our eBooks and subscribed to newsletters might be more interested in our free trial offer than one-time website visitors. We can tell as much as we were right in some aspects, but wrong in others. We set up a 21-day Facebook remarketing campaign that targeted three different audiences. We only used a single ad variation to ensure our test results would only be affected by the Facebook Custom Audiences we used. 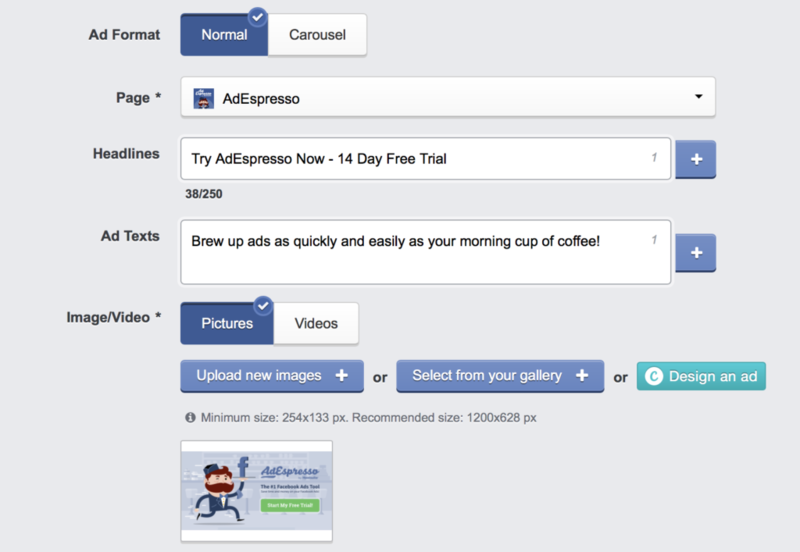 Our Facebook ad included an offer of free 14-day AdEspresso trial. As someone clicked on the ad, they were guided to our landing page with a sign-up form. As always, we used AdEspresso to make the setup process easier and faster. We also used AdEspresso to track our campaign’s performance and review the experiment’s results (which you’ll soon hear about). Not all Facebook audiences are willing to sign up for a free trial right away. If a person has never heard of your product before and you target them with a “Sign Up” offer, chances are they’re not immediately interested. Instead, marketers can create remarketing audiences of people who have already engaged with their product or content in one way or another. Naturally, we excluded the people who had already created a free trial account or were already using AdEspresso’s software. We also made sure there’s no overlap between the three Custom Audiences we tested. For example, we excluded for the Past 7 Days Website Visitors audience the people who were included in the Past 7 Days Leads audience. Luckily, we’ve got a handy feature in AdEspresso that allows testing multiples Saved Audiences. For this experiment, we used three different placements: Mobile Newsfeed, Desktop Newsfeed, and Right-hand Column. The daily budget for our ad campaigns was $30, distributed evenly between three ad sets. For the 21-day campaign runway, the total budget was around $500. We used automatic bids and optimized our ad campaign for reach. This meant that we were paying for impressions on a CPM (cost per thousand impressions) basis. The reason we optimized our campaigns for reach and not conversions is that remarketing campaigns all have a highly targeted audience. As every audience member has the same potential to convert into a paying user, we wanted to reach the maximum number of people. We decided against custom bidding as we wanted to keep our bids from affecting the A/B test’s results. It’s a best practice to only test one Facebook ad campaign element at once. If you haven’t yet made your guess, do it now: Which one of these three remarketing audiences had the lowest cost-per-acquisition and cost-per-click? Just as we hypothesized, the retargeting audience of 7 Day Leads (eBook downloaders) had the lowest cost-per-acquisition. The remarketing audience of 7 Days Website Visitors (CPA: $4.618) had a 71.4% higher cost-per-free-trial than 7 Day Leads (CPA: $2.693). The 7 Day Engagement audience had the highest CPA of $5.801. This means that the remarketing audience of 7 Day Leads (CPA: $2.693) outperformed the audience of 7 Days Website Visitors (CPA: $4.618) by 171% and the audience of 7 Day Leads by 215% (CPA: $5.801). Regarding the CTR, the 7 Day Engagement audience (CTR: 0.371%) had a 90% higher CTR than 7 Day Website Visitors (CTR: 0.195%). 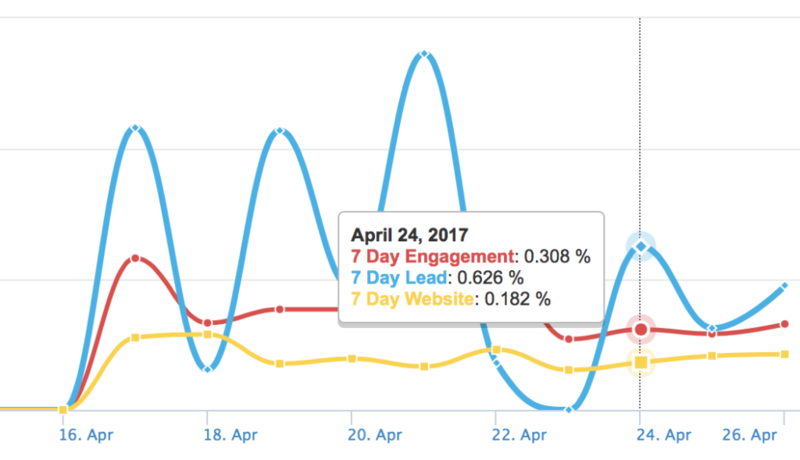 The 7 Day Leads audience had the highest CTR of 0.517%. Based on our findings, it can be said that the retargeting audience of leads outperformed the rest. That may be because these people have already visited our website and read our content, making them warm leads. It must be noted that the 7 Days Website Visitors was by far our largest remarketing audience, including 5 times more people as other Custom Audiences and resulting in over 80% of the conversions. In all cases, the cost-per-acquisition was lower than in our other campaigns targeting cold leads. This said, we recommend that you also experiment with new Facebook audiences, especially when retargeting warm leads. When retargeting past website visitors and warm leads with Facebook ads, there’s a general rule that applies to your campaigns: the warmer your leads, the easier it will be to convert them to free trial users or paying customers. The remarketing audience of 7 Day Leads (CPA: $2.693) outperformed the audience of 7 Days Website Visitors (CPA: $4.618) by 171% and the audience of 7 Day Engagement by 215% (CPA: $5.801). Our 7 Day Leads remarketing audience included people who had previously visited our website and later given us their email address. 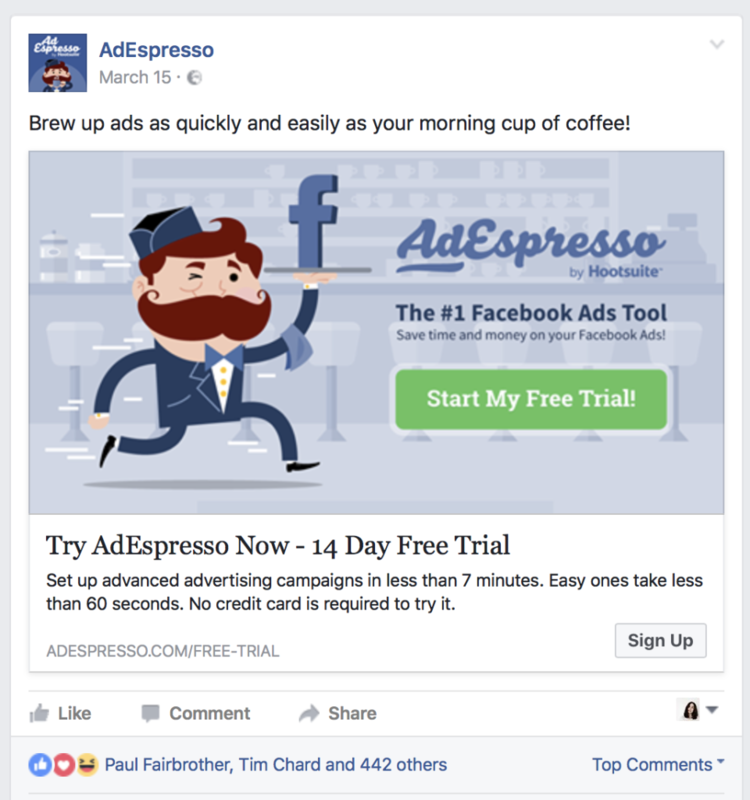 This means that they were highly familiar with our brand and AdEspresso’s Facebook ad management tool. However, it was the Custom Audience of Past 7 Days Website Visitors that included the largest number of people and brought the most conversions. While it would be nice to have more warm leads and people engaging with our Facebook posts, the retargeting audiences are limited, especially if you’re a small company. When working with small retargeting audiences of a few thousand people, it makes sense to target all of them. What are your top Facebook retargeting audiences? Have you seen similar CPC and CTR results as we did? We’d love to hear your thoughts on this! Hi there. Interesting that the objective you chose was reach. How did you track your conversions if that wasn’t your ad objective? I believe the objective was conversions, they only wanted The Facebook algorithm to focus on reach instead of conversions. Those are 2 different things! 2. You can set a frequency cap or a daily unique reach setting to your ad delivery if you want to limit your ad delivery to 1 ad vier/person per day or for example 1 ad view per every 3 days. 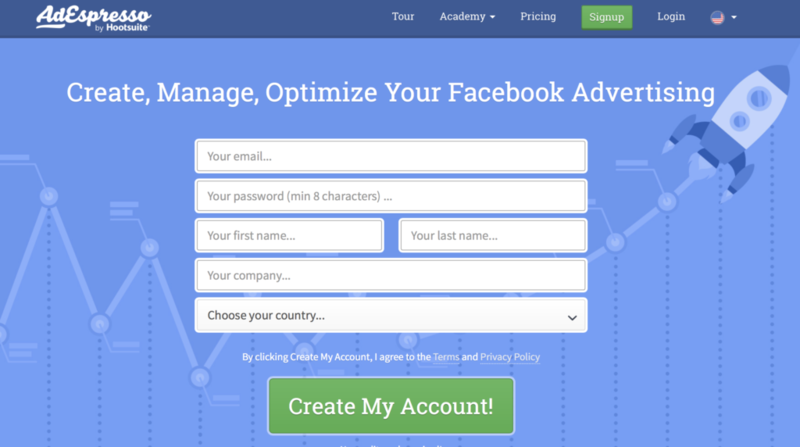 However, if you’ve set up conversions via a Facebook Pixel, you can track then no matter what’s your campaign objective. You see the conversions in every ad campaign’s reports if the conversion tracking’s turned on. I will test it for sure. I just did a campaign last week to get visitors to my website with optimized for link click with look alike audience of my website visitors and my mailing list and excluded those as well . Plus targeted only for my main country France got the ad to perform at 0.03$ per click. Will use your strategy for remarketing warm visitors to turn them into leads. Facebook helps us a lot in our business. Too many clients.